A Stearns County farmer noticed a 5 month-old calf that began showing atypical behaviors on September 30. The calf was bellowing, going off feed, showing signs of aggression, and mounting other calves in the pen. The farmer recalled seeing a skunk in the pen where the calf was housed sometime toward the end of July. The calf was euthanized on October 4 and tested positive for rabies October 10. 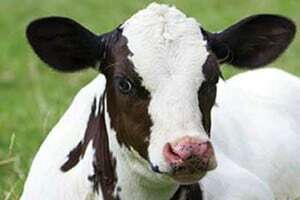 Though rabies is not typically spread from cattle to cattle, in a situation like this it is important to monitor all animals on the premises in the coming weeks to watch for other cattle to develop signs of rabies. These cattle may have been exposed to the same source (likely a skunk) as the rabid calf. There were approximately 25 more calves on the property along with more than 100 dairy cattle and a dog that is currently vaccinated for rabies. The Minnesota Department of Health did not recommend rabies shots for anyone involved in the case. When asked if he had any advice for other farmers about this type of situation, the farmer replied that he hadn’t been aware of the existence of a rabies vaccine for cattle. He said, “I will be working to vaccinate my cows and calves.” He also wishes he had paid more attention to the skunk he found in the calf pen, but at the time he didn’t think much of it. Fact sheet developed by the Minnesota Department of Health. For information on rabies in animals and to view a map of positive cases in Minnesota visit the Board’s website at mn.gov/bah and click on ‘Rabies’ under the ‘Quick Links’ at the top of the page. For questions on rabies exposure to domestic animals call 651-296-2942. 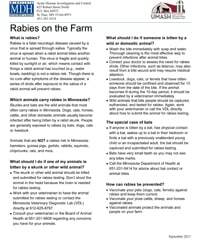 If you have questions on rabies in people, please contact the Minnesota Department of Health at 651-201-5414.